VIENNA, Va.--(BUSINESS WIRE)--Navy Federal Credit Union today announced a re-launch of its premier rewards credit card, the Visa Signature Flagship Rewards Credit Card. Navy Federal is redefining the traditional travel card, allowing members to earn triple rewards on more than just hotel points and airline miles. The enhanced card offers 3X points on all travel purchases and 2X points on everything else. Starting today, existing cardholders will be automatically upgraded to the new point structure and redemption value. “Our goal is to make sure we provide the best member service and the best financial products to fit our member’s needs. By upgrading our Flagship credit card, we’re able to deliver immediate value to almost 100,000 cardholders at no extra effort or cost to them. That’s the Navy Federal way,” added Sebastian. Navy Federal members can sign-up for the card online or through the mobile app, call the 24/7 contact center or visit any of its 319 branches. Current introductory offer includes 50,000 bonus points when cardholders spend $4,000 within the first 90 days. 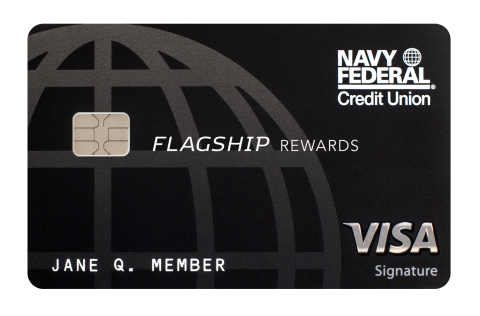 The card is serviced by Navy Federal and accepted on the Visa Signature global merchant network. About Navy Federal Credit Union: Navy Federal Credit Union is the world’s largest credit union, with more than $93 billion in assets, more than 8 million members, 319 branches and a workforce of over 17,000 employees worldwide. The credit union serves all Department of Defense and Coast Guard Active Duty, veterans, civilian and contractor personnel, and their families. For additional information about Navy Federal, visit navyfederal.org.